Mitochondria are bacteria-sized organelles (about 1 × 2 μm in size), which are found in large numbers in almost all eukaryotic cells. Typically, there are about 2000 mitochondria per cell, representing around 25% of the cell volume. 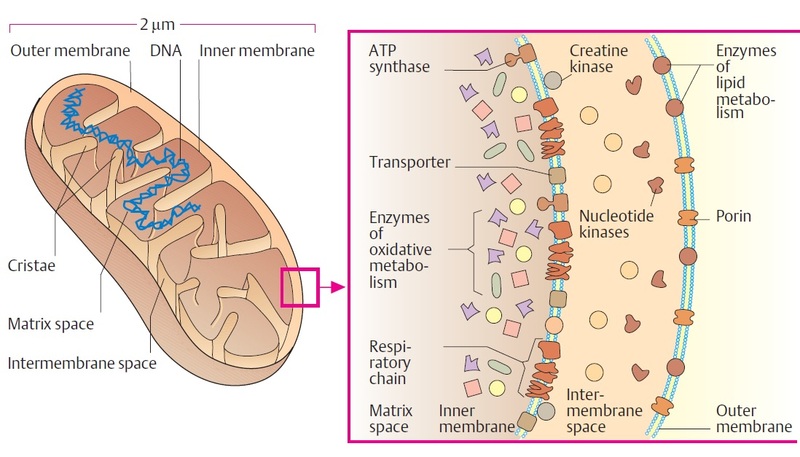 Mitochondria are enclosed by two membranes—a smooth outer membrane and a markedly folded or tubular inner mitochondrial membrane, which has a large surface and encloses the matrix space. The folds of the inner membrane are known as cristae, and tube-like protrusions are called tubules. The intermembrane space is located between the inner and the outer membranes. The number and shape of the mitochondria, as well as the numbers of cristae they have, can differ widely from cell type to cell type. Tissues with intensive oxidative metabolism— e. g., heart muscle—have mitochondria with particularly large numbers of cristae. Even within one type of tissue, the shape of the mitochondria can vary depending on their functional status. Mitochondria are mobile, plastic organelles. Mitochondria probably developed during an early phase of evolution from aerobic bacteria that entered into symbiosis with primeval anaerobic eukaryotes. This endo-symbiont theory is supported by many findings. For example, mitochondria have a ringshaped DNA (four molecules per mitochondrion) and have their own ribosomes. The mitochondrial genome became smaller and smaller during the course of evolution. In humans, it still contains 16,569 base pairs, which code for two rRNAs, 22 tRNAs, and 13 proteins. Only these 13 proteins (mostly subunits of respiratory chain complexes) are produced in the mitochondrion. The mitochondrial envelope consisting of two membranes also supports the endosymbiont theory. The inner membrane, derived from the former symbiont, has a structure reminiscent of prokaryotes. It contains the unusual lipid cardiolipin, but hardly any cholesterol. Both mitochondrial membranes are very rich in proteins. Porins in the outer membrane allow small molecules to be exchanged between the cytoplasm and the intermembrane space. The inner mitochondrial membrane is completely impermeable even to small molecules (with the exception of O2, CO2, and H2O). Numerous transporters in the inner membrane ensure the import and export of important metabolites. The inner membrane also transports respiratory chain complexes, ATP synthase, and other enzymes. The matrix is also rich in enzymes. The simpler molecules of nutrition are sent to the mitochondria to be processed and to produce charged molecules. These charged molecules combine with oxygen and produce ATP molecules. This process is known as oxidative phosphorylation. Mitochondria help the cells to maintain proper concentration of calcium ions within the compartments of the cell. The mitochondria also play important role in the process of apoptosis or programmed cell death. Abnormal death of cells due to the dysfunction of mitochondria can affect the function of organ.